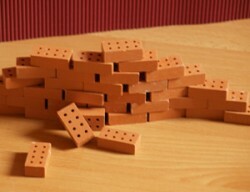 Brick manufacturer Wienerberger informed investors about a rebound of the company’s biggest division: Business in Europe is considerably behind expectations. The good performance of Wienerberger share is one thing: € 9.14 was the price of the paper on Wednesday; which is a 32-percent increase since the beginning of 2013, which is a further superlative in the ATX, the Vienna Stock Exchange’s leading index. However, the expectation of analysts is another story.